Kirstin graduated from the Royal Veterinary College in 2001. She has been practicing at Okeford since August 2001 and is now the clinical director. She completed her RCVS certificate in veterinary dermatology in 2017 and enjoys complex medical cases. Over the years she has helped train several veterinary nurses and acts a mentor to new staff. She participates in the marketing aspect of the business which includes organising an annual charity dog show and attendance at local agricultural shows. Outside work she is a dedicated mother of two, a school governor and an avid runner with her beloved dog, Lola. Philip graduated from University of Liverpool 1983. He won prizes in pathology and clinical studies, and also gained a distinction in veterinary anatomy. He is a past president of the Western Counties Veterinary Association and Okehampton Agricultural Show. Philip is interested in all aspects of companion animal veterinary care and has a very wide surgical repertoire that includes laparoscopic ovariectomies, orthopaedic cases including cruciate surgery and a variety of endoscopic examinations. He shares his life with two Jack Russells named Lottie and Tilly, a wilful one-eyed Tonkinese named Mizzle and a French ex-racehorse, Specky. Alex graduated from Bristol University in 2003 and moved to Okehampton in 2008 with her husband, who is also a vet. She joined Okeford in April 2013 and works both in the main Okehampton practice and the Chagford surgery. Alex enjoys all aspects of first opinion work and has a strong interest in medical cases. She is developing a particular interest in cardiology and enjoys using the ultrasound machine to help diagnose medical and cardiac conditions. Alex has two daughters at primary school who keep her and her husband busy. Suzie graduated from the University of Glasgow in June 2013. 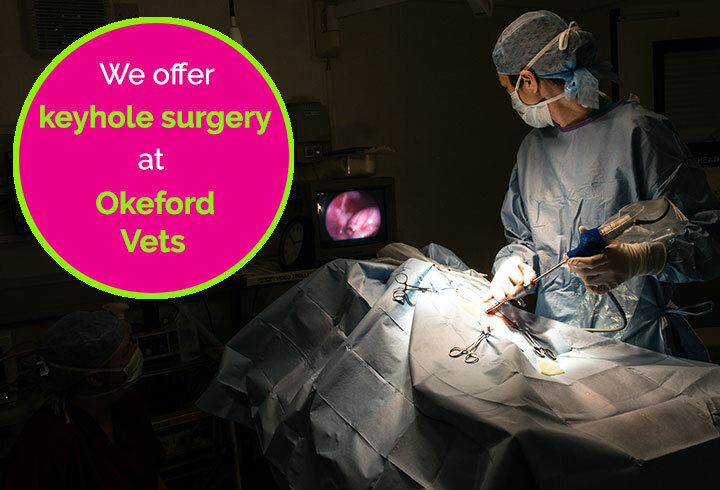 Since then she has been working as a small animal vet and is returning to Okeford after two years away which was spent enhancing her surgical and medical skills at St David's Veterinary Hospital in Exeter. Suzie enjoys all aspects of general practice and is currently working towards an advanced qualification in small animal medicine. In her free time she enjoys eventing her horses in British Eventing competitions and walking her chocolate Labrador, Polly. Rebecca graduated from Bristol University in 2007 and joined Okeford in May 2017 after moving back to Devon. She enjoys consulting and surgery, and has a keen interest in feline medicine. Rebecca also offers an acupuncture clinic at the Okehampton surgery. She has two energetic young children that keep her and her husband very busy. Claudia graduated from the University of Sydney in 2008. She worked as a mixed practice veterinarian in rural Australia and then spent some time working as a government field veterinarian before perusing her love for working as a small animal veterinarian. Claudia is passionate about her work and enjoys all facets of small animal practice. Claudia moved to the UK at the end of 2018 with her husband and dog, Nero and cat, Baci and has been with CVS since. Claudia enjoys exploring the stunning walks we have here in Devon with her dog and loves baking cakes. Jon qualified from the University of Glasgow in 2002 and spent the first seven years of his career at Okeford before moving to a small animal hospital in Bideford. He obtained the Royal College certificate in advanced veterinary practice in surgery in 2015. In March 2018, having missed the sunny weather in Okehampton, he returned to Okeford Veterinary Centre. He has a special interest in orthopaedics and soft tissue surgery. Outside of work Jon enjoys sailing, cycling and building things. He owns a poodle.